species and across locations creates a problem in being able to make general statements about the impact of different management systems on air quality. One of the measurements of air quality is the emission rate of a given gas per animal per day. In Europe, estimates of ammonia loss in free-stall dairy barns typically range between 20 45 g NH3 per cow per day or approximately 5 10% of excreted N. Ammonia loss from tie-stall barns ranges between 5 27 g per cow per day. Annual ammonia emissions are related to factors such as housing and bedding type, frequency of manure removal, ventilation, and seasonal differences in weather. Hutchings et al. estimated that 10% of excreted N is volatilized from a free-stall barn under North European conditions on an annual basis. For beef feedlots, the ammonia loss is often expressed as a concentration per unit volume (g m~3), which makes it difficult to compare among species unless sufficient detail is given to relate the air volume to a specific animal number. Hutchinson et al. reported a range of con centrations from 290 to 1200 mg m~3 for beef feedlots. Concentrations of ammonia adjacent to a swine production unit in Iowa ranged between 50 and 1000 mg m~3 (Hatfield and Pfeiffer, 2003, unpublished data). Arogo et al. reviewed the current literature on ammonia emissions from swine production and concluded that the range was 2.3 to 7.6 kg NH3-N yr-1 animal-1, with the variation being attributed to housing, manure management, and climate. Emissions from poultry operations are often expressed as a fraction of N excreted, and it has been estimated that between 15 to 65% of the N excreted is lost as ammonia. Poultry production in the United States has been estimated to contribute up to 27% of total U.S. ammonia emissions. Ammonia emissions from animal production are one of the major sources of environmental impact. Management techniques to reduce ammonia loss need to be developed and implemented on farms. Ammonia losses from animal production systems are only part of the puzzle. The differences among manure storage systems are quite large and represent significant losses of N into the environment (Table 2). Losses of N from manure may be either as ammonia or other forms of nitrogen gas. Particulates emitted from animal facilities show extreme variation within and among animal species. Hydrogen sulfide is commonly associated with swine production and is a human nuisance problem rather than an environmental problem. Likewise, the emission of volatile organic compounds (VOCs) from animal operations is responsible for the odors that emanate from livestock production. Zahn et al. 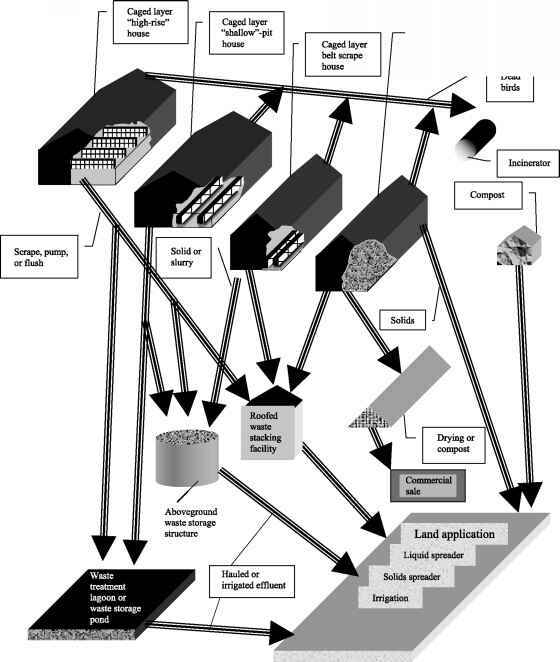 provided one of the first classifications of swine production systems for the types and concentrations of VOCs emitted from various production phases.